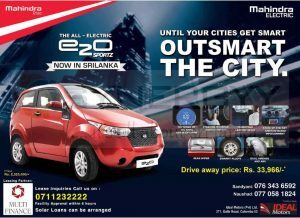 Ideal Motors (Pvt) Ltd brought you a special new year promotion till 31st January 2019 to obtain Mahindra Electric Car e20 sportz for Rs. 1,895,000/- after Rs. 100,000 discount. The Hyundai Grand i10 hatchback caris very spacious inside and has features that will make it a convincing market segment in the country. Grand i10 was launched in two options; OL Auto basic and the OL Auto fully loaded models. The Grand i10 Auto fully loaded model has an array of features to beat its competitors. 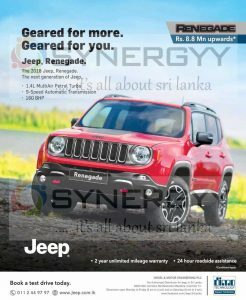 They include automatic transmission, all door power shutters, retractable mirrors, airbag, factory fitted alloy wheel, seat height adjustment, A/C, rear A/C air vent, under seat tray, keyless entry, high grade audio player with reverse camera, wrap around head lights and fog lamps, rear tail lamp, rear viper, height adjustable seat belt, adjustable rear headrest, flat folding seats and adjustable steering wheel. Grand i10 comes in 9 colours such as star dust, phantom black, purple white, golden orange, aqua blue, red passion, wine red, twilight blue and sleek silver. The Grand ilO has a 998cc engine the facilitate an impressive fuel economy. 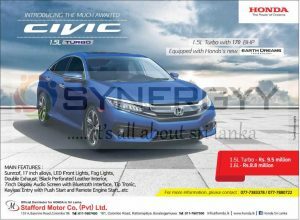 The engine is equipped with latest duel VTVT technology and is designed to deliver high engine performance with enhanced fuel efficiency and low emissions Thus the car is eco-friendly. The advanced one liter three cylinder engine chums out a maximum power output of 66ps/5500rpm and peak torque of 9.6 kgm at 3500 rpm. The engine is coupled to the four speed auto gear shifts. The larger body shell is comparatively lighter in weight to facilitate fuel economy further. It has an impressive 25 liters of trunk capacity. Safety equipments that come with the car are found only in segments above. The Grand i10 has an athletic stance of a model which is longer, wider and lower than its predecessor. 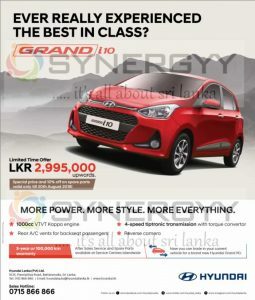 The new proportions of the Grand i10 deliver a driving experience that has been developed to meet Sri Lankan driving preferences. Relocated and retuned components result in greater body and wheel control, delivering more driver involvement and ride comfort comparable to that of cars from higher segments. 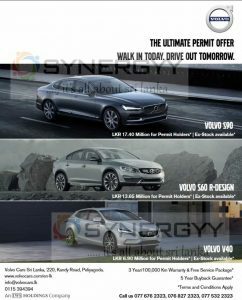 All the above models are available at Volvo Cars Sri Lanka now as ex-stock and walk-in to showroom today with your permit offer and drive out your car tomorrow. 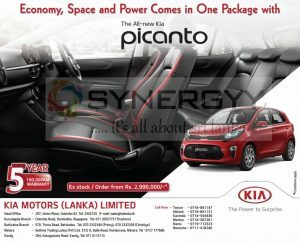 Kia announces that the Kia Picanto 2018 models Ex-stocks available for sale at a special price of Rs. 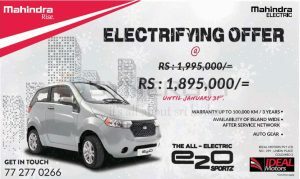 2,990,000/- upwards with 5 Years or 150,000 Km Warranty. The New Kia Picanto with Auto is good to go with Bluetooth® & iPod® connectivity2, Rear Parking Sensors and 7-Year Warranty as standard. With one model-grade to keep things simple, the New Picanto with Auto features everything you need including 5-star ANCAP safety rating. The New Picanto with Auto is both convenient and safe. There’s a 5-star ANCAP rating for safety, 5-doors to make carrying passengers easy. Perfect for inner-city streets, its design has been tailored to tighter, smaller environments. Compact bumpers specifically reduce its overall size, meaning you can navigate around the city with ease. And comes with Chorme Grille Surround, European Design, Rear Parking Sensors and Daytime Runing Lights. Inside the New Picanto with Auto you’ll find a cabin filled with high-quality materials. Satin-silver accents along the dashboard and steering wheel lend to the New Picanto with Auto’s stylish nature. An efficient 1.25 litre 4-cylinder engine with 63kW of power. Automatic Transmission As Standard and a smooth 4-speed Automatic transmission is standard across all Kia Picanto models. 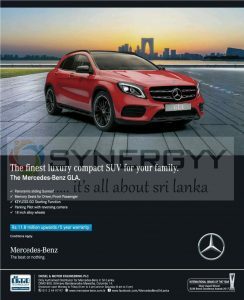 DIMO only authorised distributor for Mercedes-Benz in Sri Lanka brought announces the updated price for Mercedes-Benz GLA as Rs. 11.8 Million upwards with 5 Year warranty. 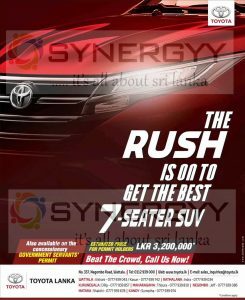 All the above with 2 years or 40,000 km agents warranty [whichever comes first]. Services from Spectrum Trading Co (Pvt) Ltd. 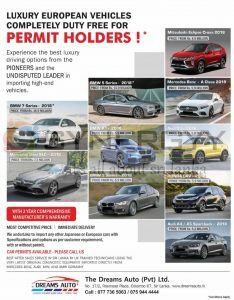 Specially selected vehicles conforming to brand-new standards. First 2 services free, (labour + material). 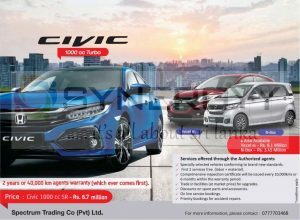 Comprehensive inspection certificate will be issued every 10,000kms 6 months within the warranty period. Discounts on spare parts and accessories. Priority bookings for accident repairs. 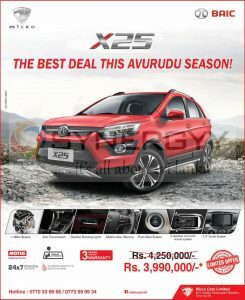 Micro Cars announces a special promotion price for Micro BAIC X25 2WD SUV for Rs. 3.99 Million as limited offer. The offer is valid only on limited time and for limited stock.